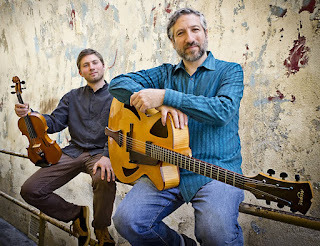 Pull-String Duo will perform original chamber-jazz compositions from their new release on Arabesque Recordings, "Left Open". Meeting at the crossroads of jazz and chamber music, David Dvorin (guitar/composer) and Matej Seda (violin) of Pull-String create intimate ensemble performances of original compositions. Truly un-classifiable, the group strives to synthesize seemingly disparate musical elements with such diverse influences as modern jazz, avant-garde chamber music, American and European folk music, and rustic blues. Hailing from diverse cultural and musical backgrounds, Matej and David came together in 2012 with the unified goal of reinventing the classic violin/guitar duo, updating and expanding it’s stylistic borders to include the aesthetics and rigor of contemporary art music. It is immediately apparent upon listening to them perform that the duo share a deep level of communication, building on their shared musical language to make something extraordinary.